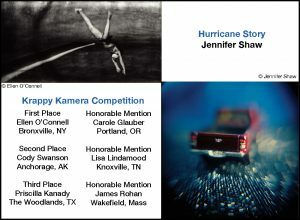 Soho Photo Gallery features Hurricane Story as a solo exhibition in conjunction with their 18th annual Krappy Kamera exhibition, from March 1 – April 2, 2016. Located in lower Manhattan, Soho Photo Gallery is New York City’s longest running co-operative photography gallery. Each year they celebrate lo-fi photography with an open call competition, and highlight one plastic camera artist with a concurrent solo show.